For this month's Bread Bakers Wendy Klik of A Day in the Life on the Farm has choosen Irish Bread as theme. It was wonderful to bake this traditional Irish Bread - Blaa. 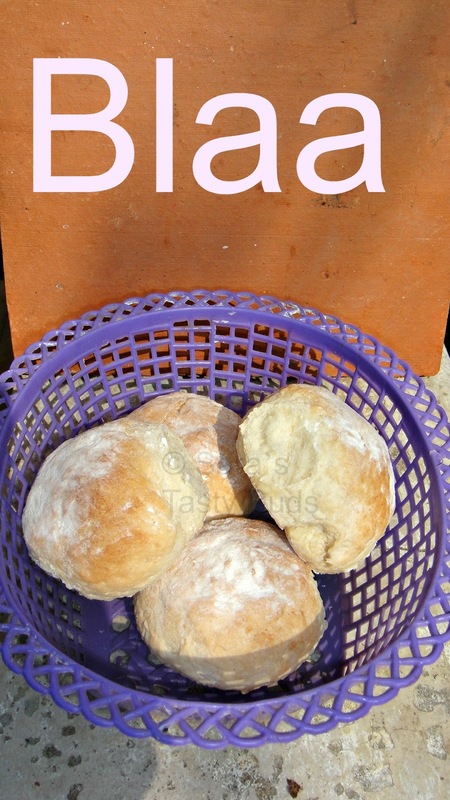 A blaa is a doughy, white bread bun (roll) particularly associated with Waterford, Ireland. It is currently made in Waterford and County Kilkenny and was historically made in Wexford. Blaas are sold in two varieties: “Soft” and “Crusty”. Soft blaas are slightly sweet, malt flavour, light but firm in texture and melt in the mouth. Crusty blaas are crunchy at first bite, then chewy with a subtle malt taste and a pleasing bitter aftertaste from the well cooked, dark crust. The blaa was introduced to Waterford at the end of the 17th century by the Huguenots, the word is thought to have been derived from the French word for white, blanc. 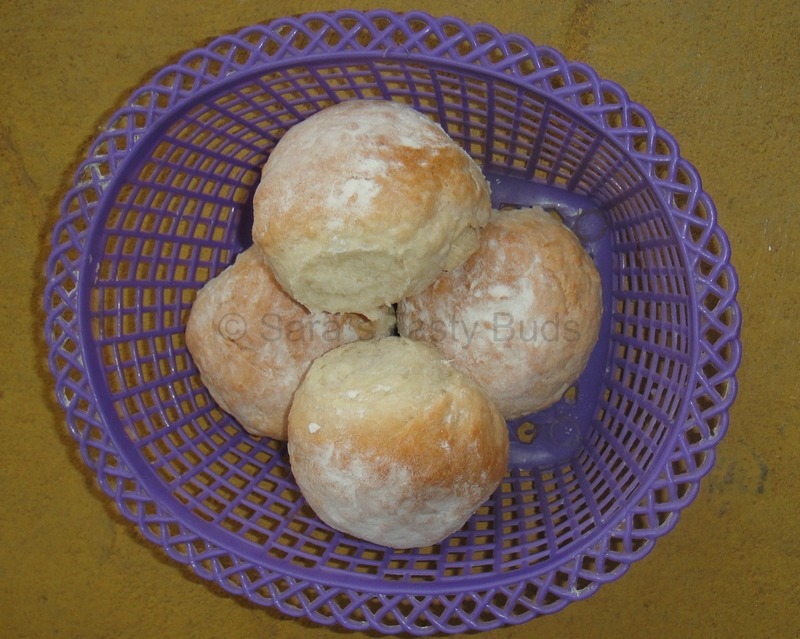 Waterford Blaa contains no preservatives or enrichment and is made solely from preservative-free strong bakers’ flour, table salt, compressed yeast, dough conditioner and water. 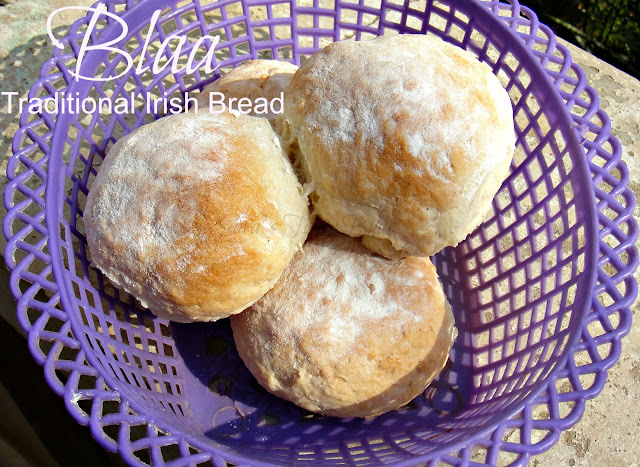 The addition of flour gives the product the white finish on top , which results in the rough cracked appearance of the ‘Waterford Blaa’, which is a characteristic of the product. As they are not baked with steam, the heavy dusting of flour is both for protection from oven heat and to enhance the appearance. Throughout the production process of there is excessive use of flour, at pinning, resting, etc. There can also be flour on the base. They are characteristically not uniform in shape and size. The dough that is used to make it is tougher and does not contain as much water as other products. It is baked for longer, producing a stronger crust which contains the distinctive malt flavour. Waterford Blaa is a popular breakfast product usually baked during the night and sold as a bread product normally eaten with butter or as a mid-day snack to make sandwiches with a variety of fillings, including fried potatoes, dillsk, Irish fillet steak and relish. However, it is a popular belief that It is best when torn apart by hand and eaten fresh, straight from the bakery. Mix sugar and yeast to the lukewarm water and keep it for ten minutes. It will be frothy. In a bowl , mix together flour and salt . Add the frothy yeast mixture and mix well. Knead the dough for 10 – 15 minutes until it becomes soft and elastic. Place the dough in an oiled bowl and cover it with cling wrap. Let the dough to double. Punch and divide the dough into equal parts. 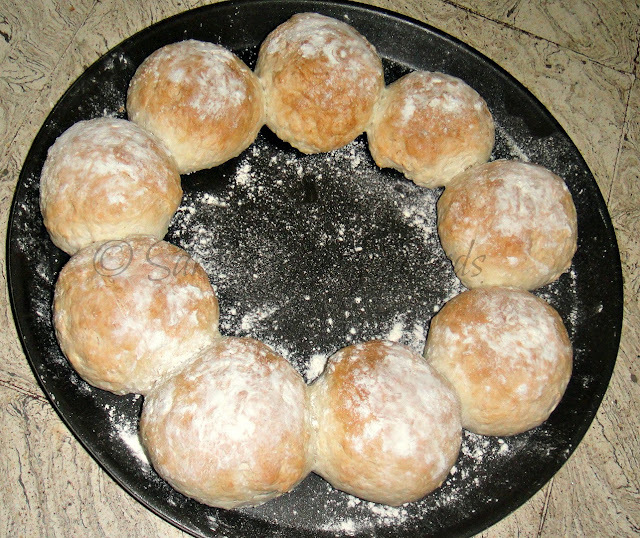 Roll each part into round balls and arrange in the baking tray. Allow for second rise. After the rise the round dough balls will become slightly square in shape. Dust the flour on each roll and bake on a preheated oven for 20 minutes @ 200*C.
The Blaa will be lightly browned and sounds hollow when tapped. The difference between Blaa and Bap will be the flour dust remains white on the blaa after baking too…. Blaa will be having a crispy crust and soft inside. I was curious as to what it was when you posted the title. Thanks for introducing me to this bread. I love Waterford blaas! I've made them several times, and they disappear. Nice job! Sara, I just love all the historical information you provided. Excellent post and the blaa looks yummy. I've never heard of this bread before but it looks delicious. I think I would love either version the soft or crusty. Your bread came out beautifully! This is a new bread for me and I will have to look for it on our next trip to Ireland. If I can't wait that long I'll have to make it at home! I'd never heard of "blaa". Thanks for writing about this. It's so great to discover new breads. 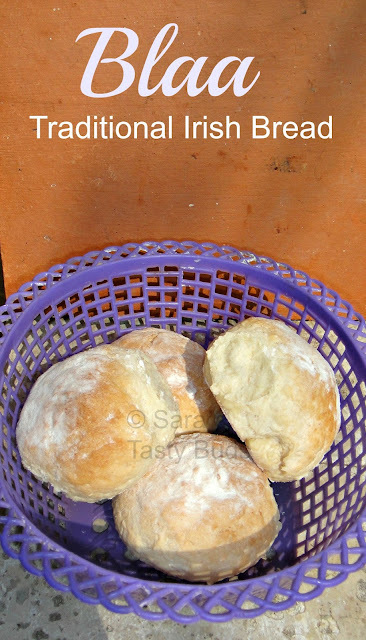 Sharanya love the historical facts about blaa.... have heard of the buns but didn't know where they originate from.Lovely share. 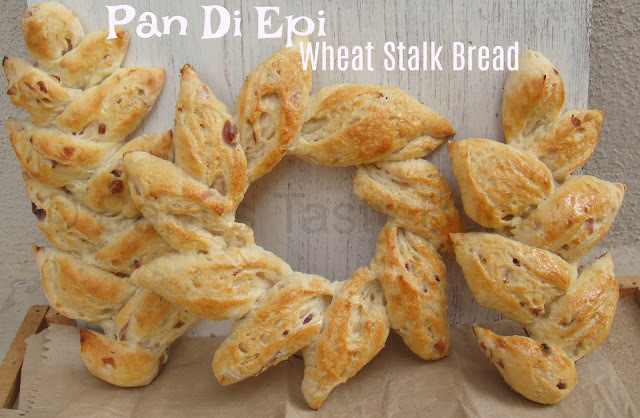 Saranya, these breads look really pretty. Perfect for dinner rolls! What an amazing Irish bread that is. Simple ingredients, but looks so amazing and interesting. nice to read about a new bread, Saranya ! liked the rustic feel there !